Thanks so much for visiting toquiltorknot. You can also find us on F/b as Quilters of Greece United or on our new shop page, QUILT BAR. I hope our site will inspire you to help us make a difference as we love people and reach out to their desperate needs with a message of hope. Project A-21 --our effort to love and encourage women who have been traffiked with the gift of a quilt to mark their journey of healing. 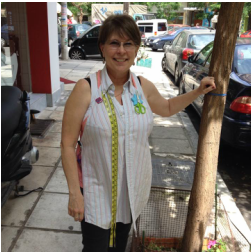 Learn how we are teaching and working with young widows and single moms in Katarini, Greece to create and develop business opportunities through Katerini Quilts. Learning to use quilting as a means of income will equip these women to provide for the needs of their families. Check out some of our ongoing efforts to encourage residents of local nursing homes and orphanages in Thessaloniki, Greece. In March of 2014 we opened the first ever quilt shop in Thessaloniki, the cente, so you will see a new face to our site but our purpose remains the same. We are a non-profit organization trying to create an atmosphere of φιλότιμο with the work we do.